I usually drink tea first thing in the morning, but since we got a coffee grinder, I’ve been making stovetop espresso coffee. I LOVE hearing that metallic whirrrrrr pulverizing the beans first thing in the morning. It gets me excited to start the day. We have two stovetop coffee pots at home, a 1-cup and a 6 cup. Both the classic Bialetti, otherwise known as the Moka Express. 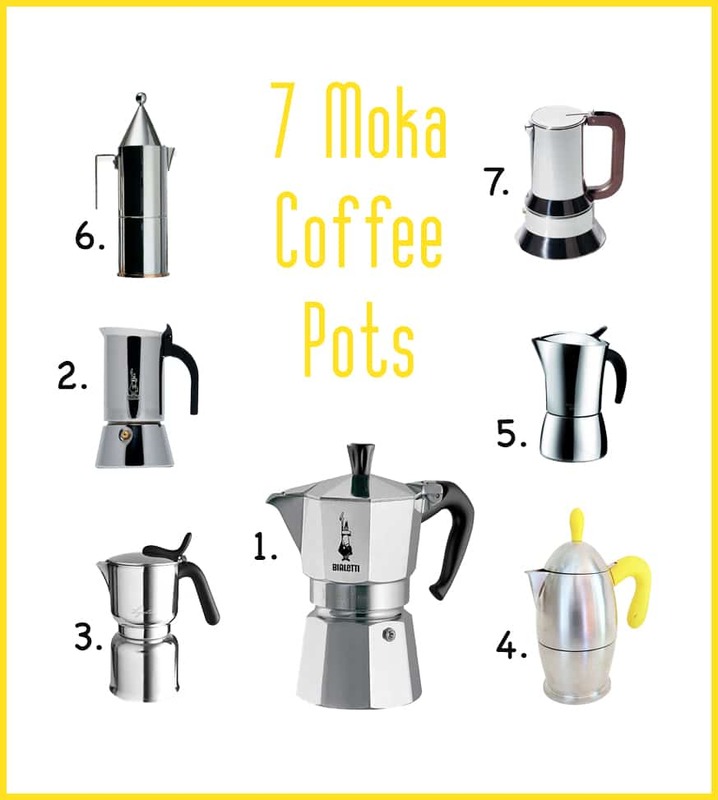 A moka pot is the common word for stovetop coffee pots, which most people in Italy simply shorten it to moka. The moka pot has three units – the bottom part that holds the water, the middle filter cup that holds the ground coffee, and the top part where the coffee is released. The process starts by placing the pot on the stove. Once the water starts to boil in the bottom part, the steam travels upwards through the ground coffee and into the pressure valve where the final coffee is released into the top part. Bialetti made the first moka in 1933, the classic that is in millions of Italian households. For years, my mom made coffee for herself with a 4-cup moka and drank it out of a mug until the doctor told her to cut it out. I’m looking for a 3-cup italian coffee pot now that I’m drinking coffee, too, in the morning. There are so many designs out there! I’m taking my time shopping for a new one and I’ve put together a little list for you all that may be looking for one, too. Even if you have one, you can always use another one if you have guests. I’m leaning towards the Bialetti Venus (No. 2) Which ones do you like?